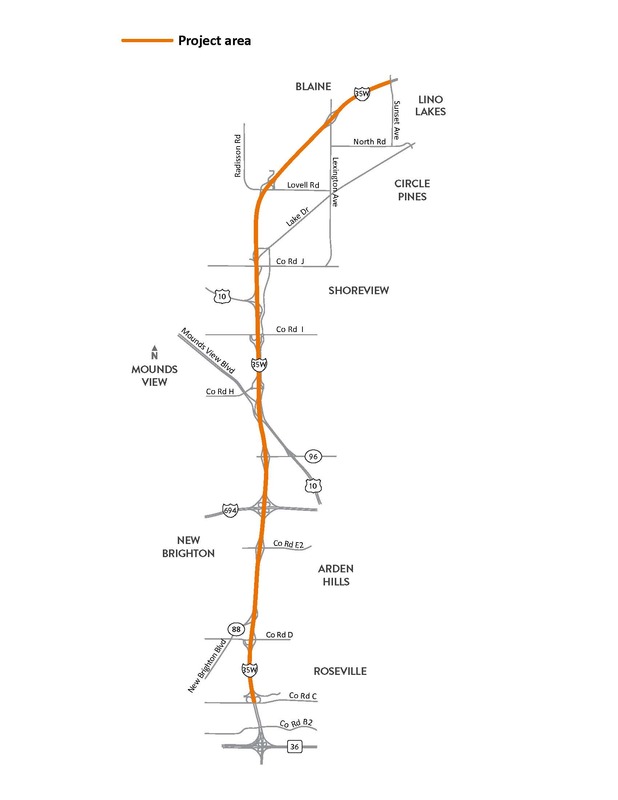 I-35W North MnPASS project location map. MnDOT is currently installing temporary traffic control on local roads to manage local road impacts due to construction. All closures are weather dependent and subject to change. Note: During construction, most SB I-35W ramps close for several weeks at a time. No two consecutive ramps will be closed at the same time. I-35W ramps to/from I-694 and at the northern Hwy 10 interchange will remain open. NB I-35W is reduced to one lane between Co. Rd. I and Hwy 10. State Patrol will be onsite to coordinate intermittent short-term (15-20 minutes) closures. I-35W will have periodic lane closures in both directions between Hwy 36 in Roseville and Sunset Ave. in Lino Lakes. The closures may occur from 8 p.m. to 5 a.m.
I-35W in both directions is reduced to two lanes between Co. Rd. C and Mounds View Blvd. I-35W in both directions remains two lanes between the northern Hwy 10 interchange and Sunset Ave. The I-35W North MnPASS project will be done in stages. Learn more about the stages and anticipated schedule. Some work will need to occur at night, especially if temporary additional lane closures are needed. Crews will try to minimize night work and noise, but please expect to hear overnight activity periodically. If night work needs to occur on local streets or an activity is expected to be particularly noisy, updates will be posted here and sent out by email. Click here to sign up for email updates. Co. Rd. C between Long Lake Rd. and New Brighton Blvd.